Vibratech TVD offers more than just diesel and gas compression torsional viscous dampers for crankshafts. Rotating shafts also present a NVH challenge. Speed fluctuations create torsional vibration that can damage downstream components or create uncomfortable noise conditions. To resolve concerns manufacturers also turn to Vibratech TVD for our extensive driveline vibration damper knowledge, ISO 9001:2008 Design and Development certified process, and manufacturing capabilities. Hybrid transmission drives on buses. Fire engine piston driven water pump shafts. Auxiliary starter shaft drive gears. In each of these examples Vibratech TVD developed a tuned viscous damper specific to the driveline application with the goal of improving durability and overall quality. To understand more about the benefits of viscous driveline vibration dampers and how they are different than crankshaft dampers, download the new Vibratech TVD article Driveline Vibration Damper Development. 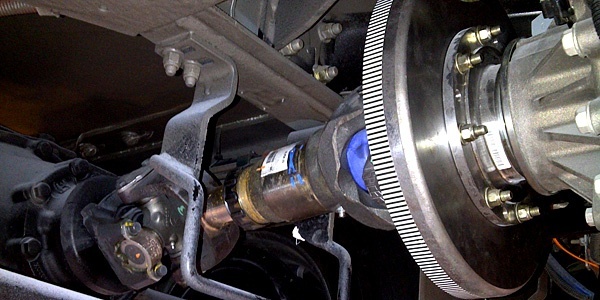 Included is an actual case study on how Vibratech TVD resolved NVH related to a hybrid transmission driveline growl in a transit bus application.